Not only is it important to plan and implement wonderful learning activities for children, it’s important to observe what’s happening during the activity. Learning is a process and we want to see where each child is in the learning process. We can do that through observation and begin to see learning everywhere. 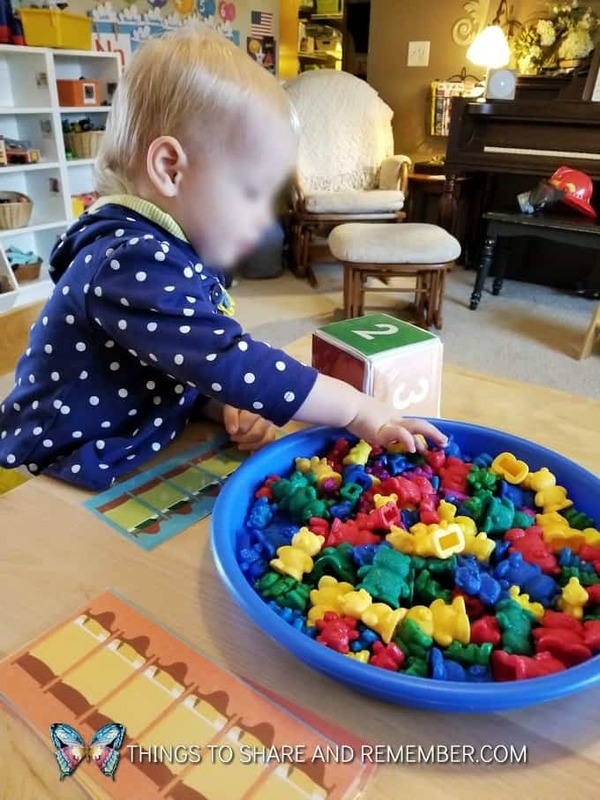 By observing a child, we can learn about what they like or don’t like, what they know, how they learn, what their interests are, how they react to situations, how they interact with other children, how they communicate and what their skill level in a certain area is. We need to use this information to create individual goals and lessons for each child. I enjoyed this article about observation. 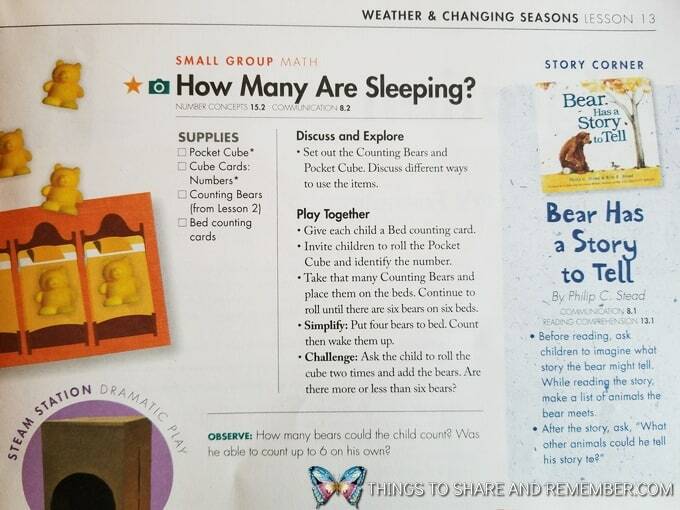 One of the small group activities from our Mother Goose Time theme of Weather & Changing Seasons, was called How Many Are Sleeping? which related to the daily topic of hibernation. 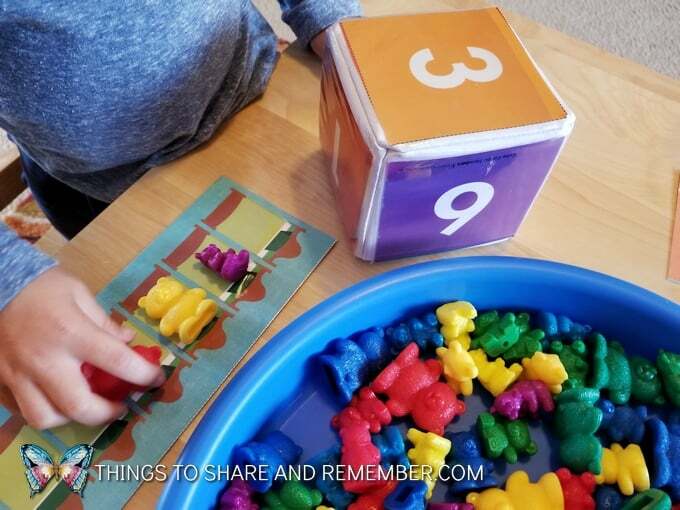 It’s a simple game that includes bed counting cards, a pocket cube, cube number cards and counting bears. The first time I introduced this activity, I worked with the whole group. We took turns rolling the cube, identifying the number and counting bears. 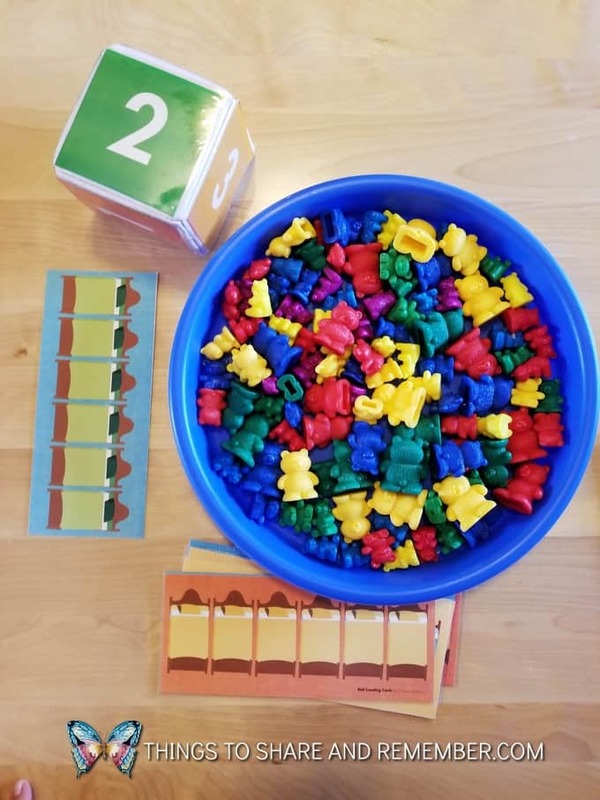 Sometimes during group time, it’s hard to take time to access development because everyone needs so much guidance with a new activity, especially with a mixed age group. It’s really an open-ended investigation time to explore and enjoy working with the bears, talking about colors, size, counting and guiding whoever I can. Sometimes I make mental notes or write them on the inside of my teacher guide on the planning pages. Usually, I snap some pictures and then work on assessment later. First of all, we need to know what we are assessing. The Mother Goose Time assessment system selects certain activities each week to assess so by the end of the month, you’ve assessed each child on a range of skills. 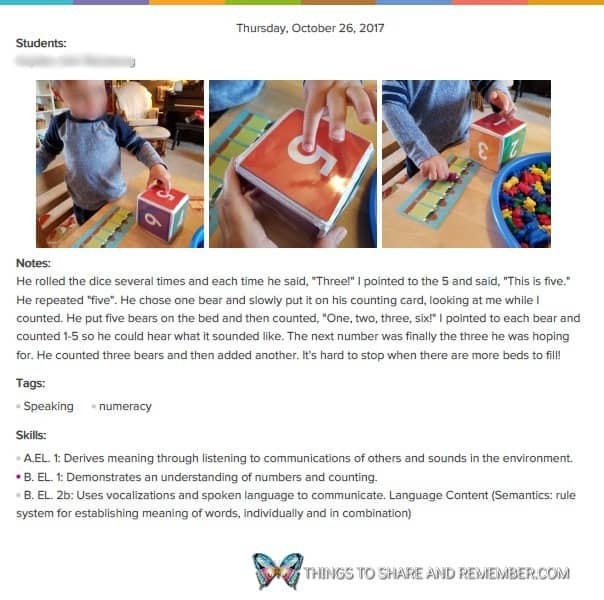 At the top of the activity lesson plan, it tells us that this is activity focuses on Number Concepts and Communication. 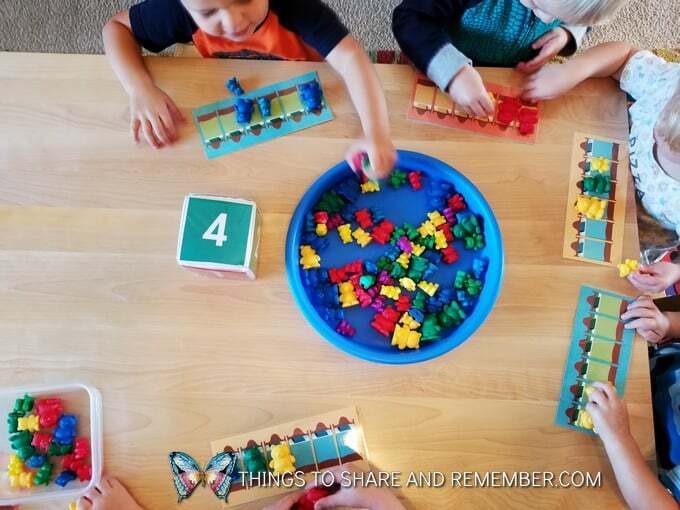 At the bottom of the activity, there is a prompt for observation that says: How many bears could the child count? 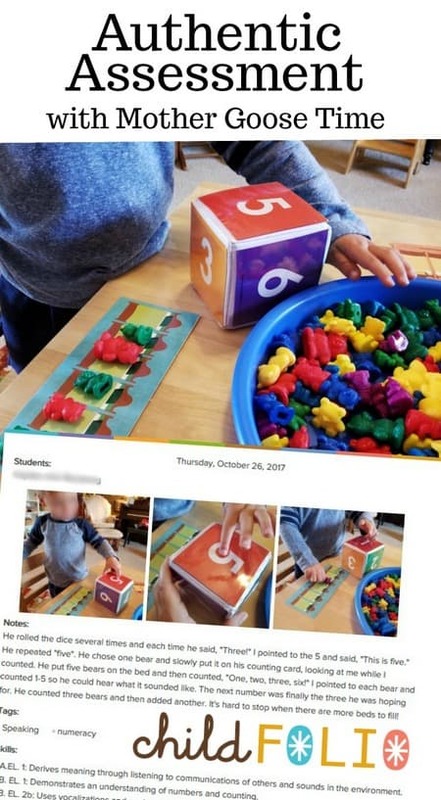 Was he able to count up to 6 on his own? I believe there’s much more than those two observations that can be made, but that is a good starting point. It actually wasn’t until the next week that I sat down during free play time with the activity once again. I asked who wanted to play with the sleeping bears game? No takers. Everyone was busy playing school or with other toys. The 18-month child came over so I checked to see what I could find out about her development. At her age, I didn’t expect her to identify a number. I didn’t expect her to count 1-6. But younger children can still benefit from this activity too! I noticed that she chose mostly purple bears! Interesting. This may show that she favors the color purple and that she can sort colors (I already know that she can). She is making choices for herself. She pointed to the bears and made sounds of “One…two…”. 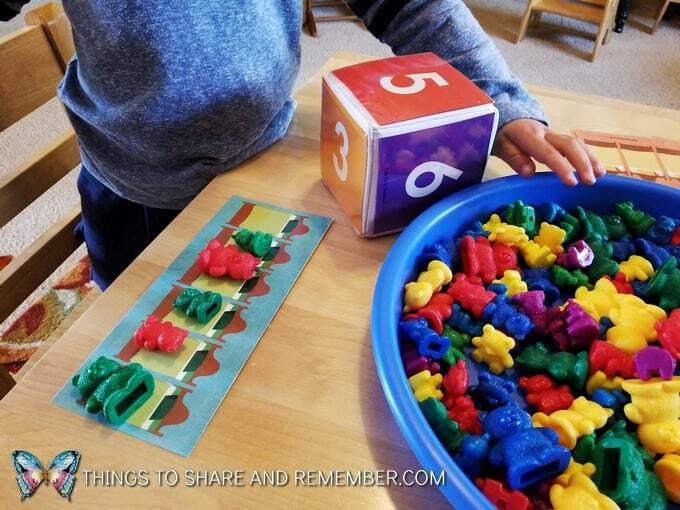 This is the beginning of counting skills! I pointed to the 5 and said, “This is five.” He repeated “five”. He chose one bear and slowly put it on his counting card, looking at me while I counted. 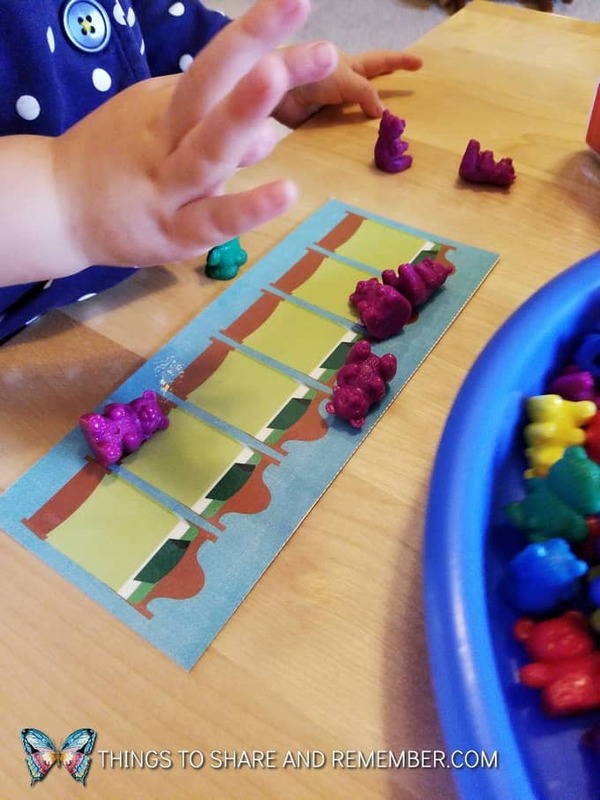 He put five bears on the bed and then counted, “One, two, three, six!” I pointed to each bear and counted 1-5 so he could hear what it sounded like. A 5-year-old came over and pointed out that he had created a pattern -green/red/green/red/green. So we talked about that too. The next number was finally the three he was hoping for. He counted three bears and then added another. It’s hard to stop when there are more beds to fill! He called the numeral a “number” even though it was the wrong number. He placed one bear to one bed, which is one to one correspondence. He’s beginning to point to objects one at a time when counting. He doesn’t yet recognize numerals. Next up: 4-year-old – this is so easy for him. He rolled the dice and said, “Four”. Then he counted out four bears correctly. He counted using a “bored tone” like this is so easy. 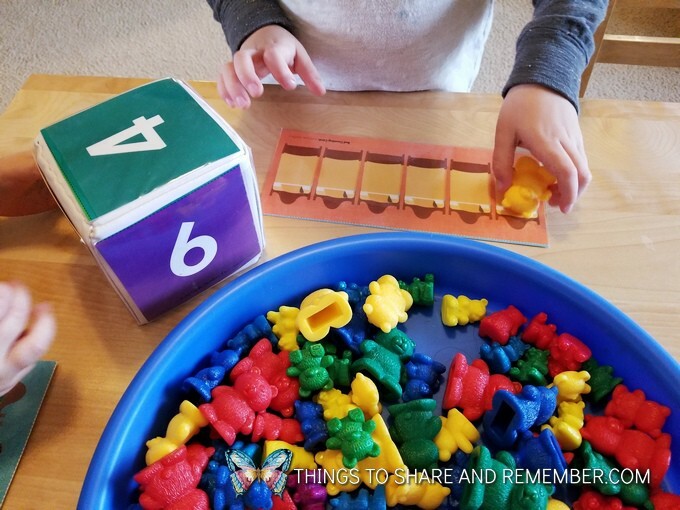 He identifies numerals 1-6 and counts objects one by one up to 6. He matches one bear to one bed. Now, what do I do with this information? First of all, document it. Usually, I make notes in my teacher guide to record later. I’ve taken photos so I can look back at them and remember too. 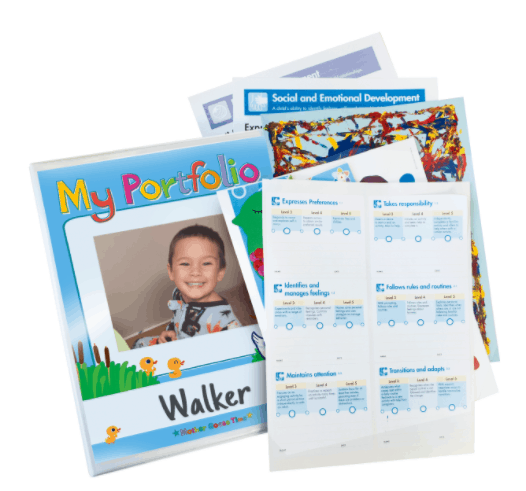 I keep physical portfolios at this time but I’ve also started using Childfolio, an online assessment, and documentation tool. 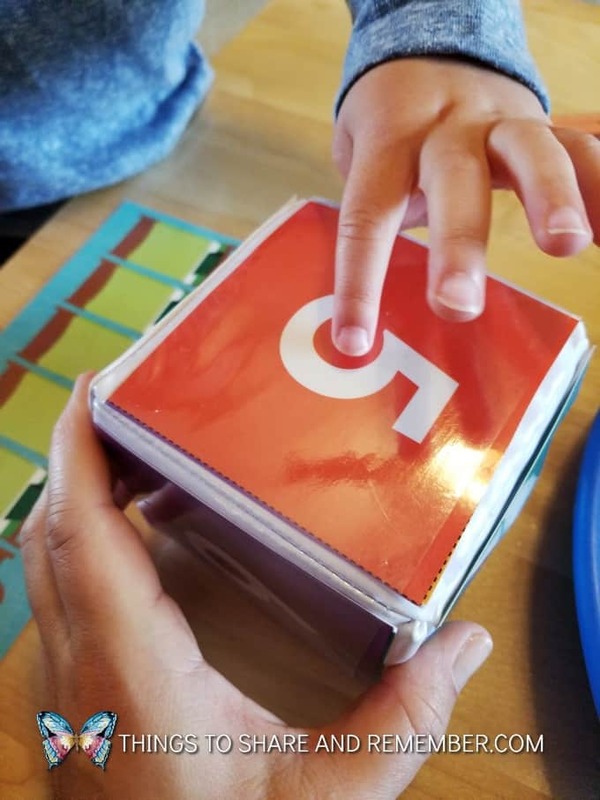 Mother Goose Time has an excellent assessment system that I’m really just getting into using in a combination with Childfolio. 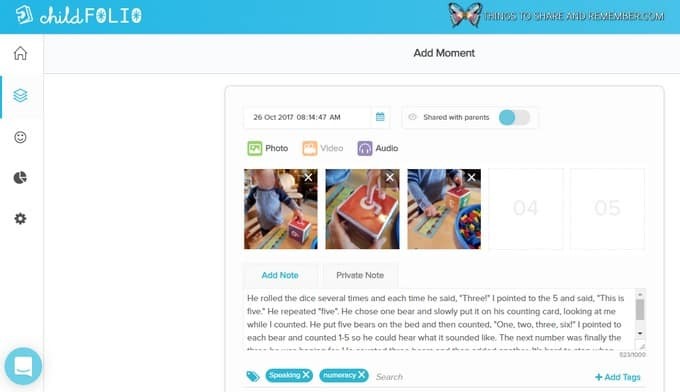 This a look at Childfolio on my screen – it’s easy to enter an observation in (which I would word differently normally, but I just copied the text from this post as an example). Upload photos, add notes, and tags. 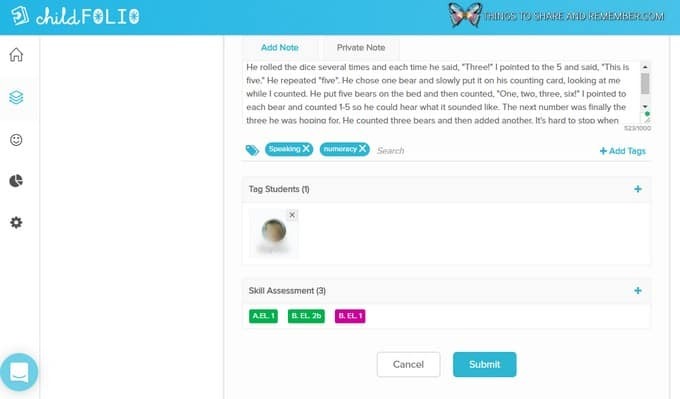 -Select the child this entry applies to, and add in skill assessments and benchmarks if desired. This is what a “moment” looks like if you open up a PDF copy. You can print this for the child’s portfolio or choose to share it with the parents online through the app. For more information on using Childfolio, see this video. 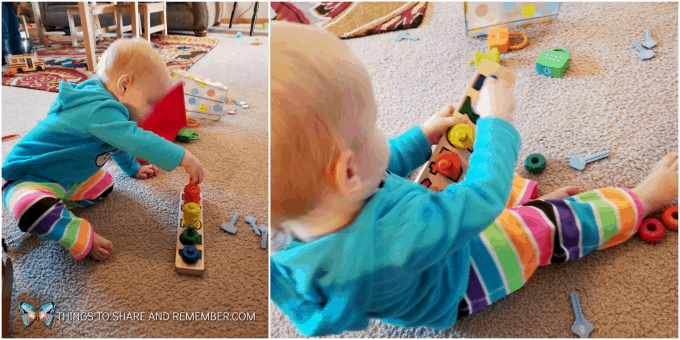 It’s important to tell stories about the child’s learning, even if you don’t use skill ratings, to show parents how their child is learning through play. 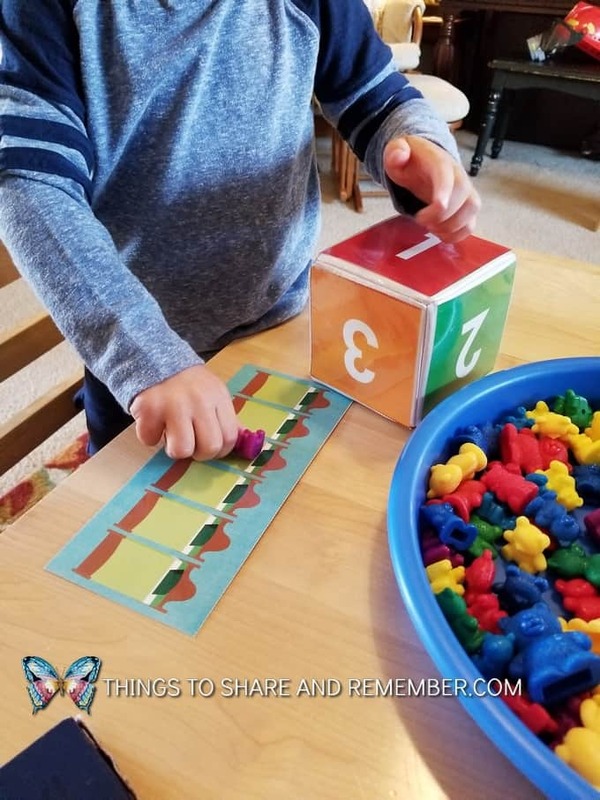 Sharing moments like these involve parents in their child’s learning and makes a connection between school and home. They can continue to work on these skills with their child at home. Not only is it for the parents, it’s for the educator too. When I see where children are in their learning, it helps me plan the next activity. I can help each individual child develop the next skill they are ready for. This is intentional planning and teaching. During free play time, I observed this 18-month-old stacking rings on the color sorter, by color. As I watched her, I noticed that she purposefully selected a ring and put it on the correct spot by color. She did it consistently with each ring, even changing one that she decided was wrong. Amazing! I didn’t know she could do that. I didn’t ask her to do it, and we haven’t practiced it, but she chose to do this activity and I saw what she is capable of. 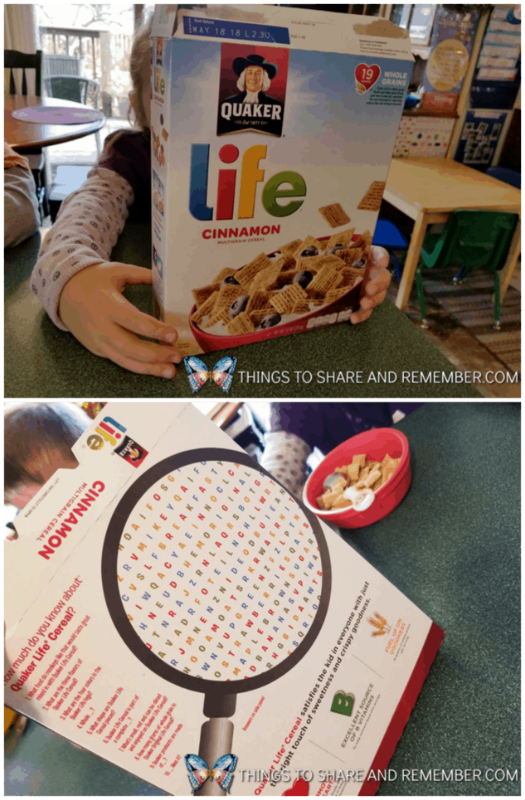 At snack time, the children asked if they can see the back of the cereal boxes. This is an excellent way of incorporating pre-reading skills so of course! While I was getting morning snack ready, I heard the 4 & 5-year-olds looking for the letters of their names. I didn’t tell them they should do that, they wanted to and could find all the letters of their name in their spelled order. 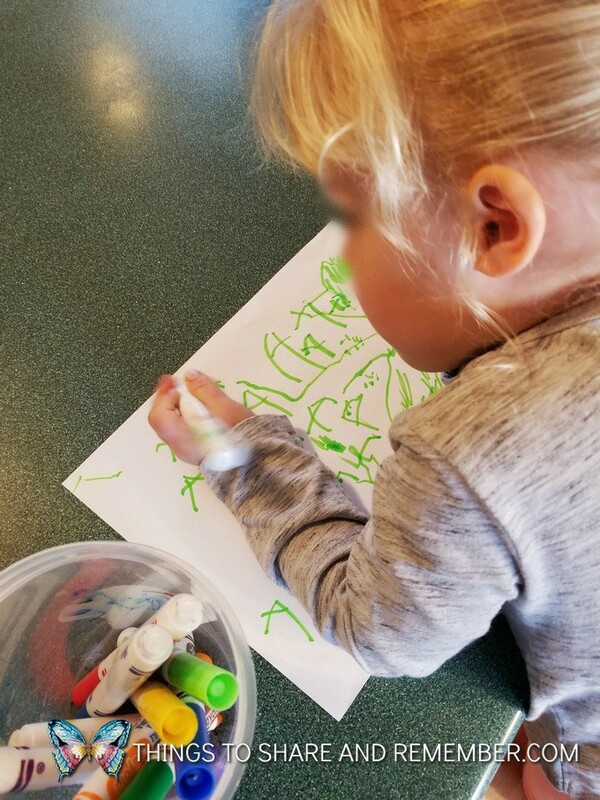 During free play time, this 3-year-old chose to color and write with markers. When I peeked at her work, I could see she is practicing writing letter A! Again, during free play time, a 4-year-old asked for the velcro letters that go along with the Chicka Chicka Boom Boom tree. 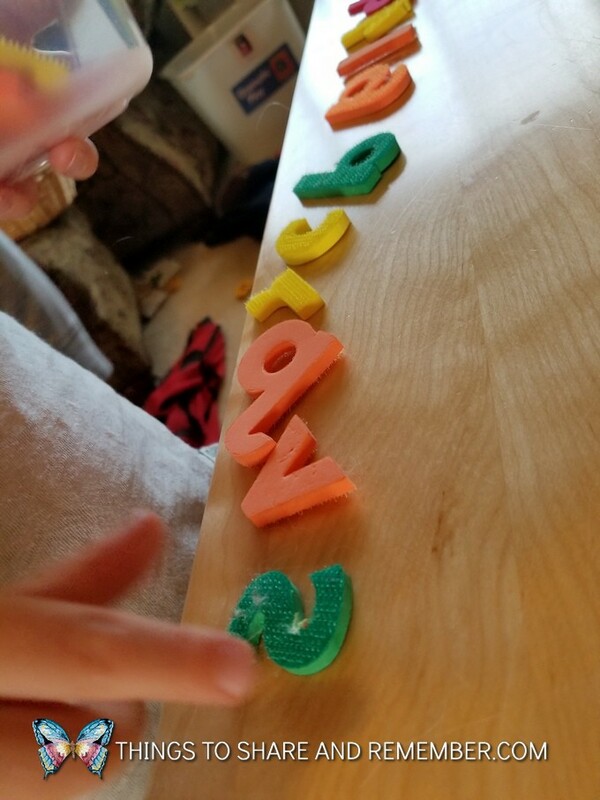 After I reached the container for him, he laid each letter out on the table and named it as he put them in a line. He was showing me what he knows! So I made a note of it. I didn’t have to sit him down and point to a letter and ask him if he knows it. This is authentic assessment. Planning and teaching won’t be as effective as it could be if we don’t observe and document what we see what children know and are doing. Using this information we can make learning visible for ourselves as well as parents. Then we can use the findings we’ve collected to intentionally plan, modify and adapt lessons for each child. And the teaching cycle continues.